Perfect for quick & easy snacks & meals. You can use them for lunches or even a kebab dinner. I like that you fee like your eating bread but it’s so much healthier & much lighter on your stomach! 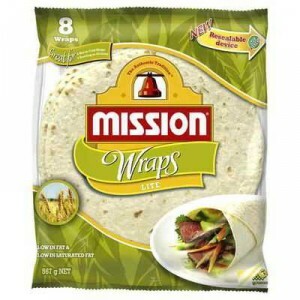 Mission wraps light are so versatile for all sorts of meals, whether a lunch wrap, a home made pizza, or as an accompanying to an indian curry, they are always delicious. Just wish they were a little cheaper. Mission Wraps light are a great wrap for our lunches,the light wrap is good and we enjoy chicken and salad for a delicious and healthy meal. I have one child that doesn’t want wraps but this one has a very mild flavour and he will eat it toasted with a splash of garlic butter. Very good size and can be used so many different ways. Always so fresh and last quite a while if I buy too many at a time. Mission wraps have a good taste whether they are the standard type wraps or the light type wraps. Perfect for making wraps with delicious summer style fillings. Easy to roll and wrap. I love these wraps. They are perfect for lunches with salad. I also use them for a baritto lasagne recipe for main meals. Beautiful product that is popular in our household. We love these wraps and always have a lack in the freezer. We use them for tortillas and also fully loaded wraps for lunch. The kids love them to because there really soft and tasty. We love these wraps for school lunches or a light dinner or wraps or soft tacos. They’re larger than most tacos so you can fit all your fillings and not rip them apart! They also freeze and thaw really well so buy some one sale to keep on hand! How would you rate Mission Wraps Light?